‘Elevator B’ is a Gleaming Skyscraper Home for Bees! Most cultivated honeybees are happy with simple wooden boxes for homes - however a bee colony in Buffalo, New York recently upgraded to a sparkling waterfront skyscraper! “Elevator B” is a new steel, glass and cypress “apartment” building for the bees, designed by students from the University of Buffalo. The bees were moved to the honeycomb-inspired structure after they were discovered living in an abandoned and decaying grain mill nearby. The gorgeous Elevator B is a suitable new home for the thriving colony. 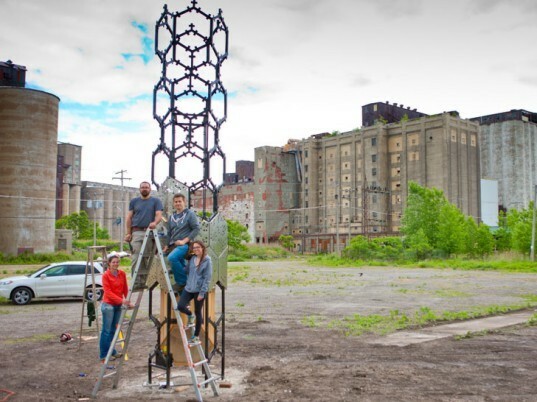 The gleaming hexagon-paned tower was created by four architecture students, Courtney Creenan, Scott Selin, Lisa Stern, Daniel Nead, and Kyle Mastalinski in a contest organized by UB’s Ecological Practices Research Group. The contest asked the students to create a living structure – one that the bees could live in that would help them continue to thrive amidst the city. The structure was also commissioned to educate the public on the importance of bees, and their role in our ecological system. Elevator B gently mimics the long-abandoned silos that sit on the land on Buffalo’s waterfront, where the bee colony was found. The glittering structure rises twenty-two feet, and it stands freely on the silo city grounds. The framework of hexagonal shapes allows the bees to freely live and build just as they did in the similarly shaped grain silos adjacent to the new tower. After completion, the bees were carefully moved from their dilapidated home, into Elevator B. Visitors can enter the tower, and look up to watch the hive’s activity with a moveable glass window.The window can be lowered by a trained beekeeper, who will check on the bees to ensure the health of the hive. The tower will also insulate and warm the bees in the harsh Buffalo winters. As a reward for their labor, the honey from the original grain silo hive was pressed and shared amongst the designers and builders of the new hive. 'Elevator B' is a Gleaming Skyscraper Home for Bees! The bees were moved to the honeycomb-inspired structure after they were discovered living in an abandoned and decaying grain mill nearby. The gorgeous Elevator B is a suitable new home for the thriving colony. The contest asked the students to create a living structure - one that the bees could live in that would help them continue to thrive amidst the city. The structure was also commissioned to educate the public on the importance of bees, and their role in our ecological system. Elevator B gently mimics the long-abandoned silos that sit on the land on Buffalo’s waterfront, where the bee colony was found. The glittering structure rises twenty-two feet, and it stands freely on the silo city grounds. 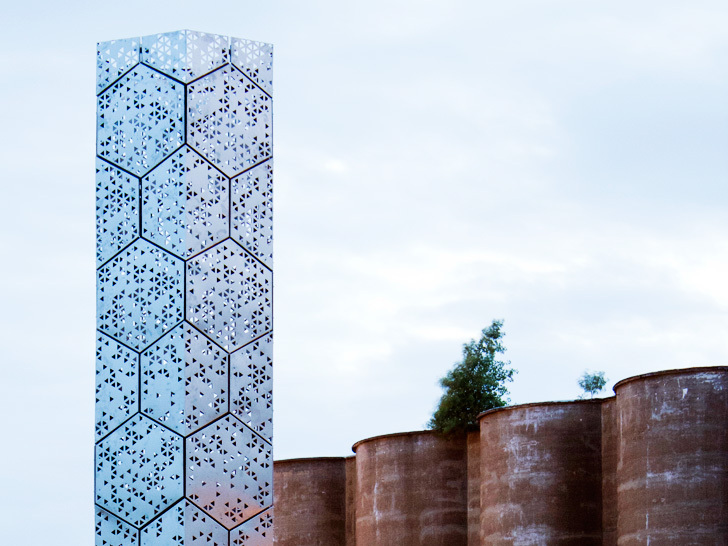 The framework of hexagonal shapes allows the bees to freely live and build just as they did in the similarly shaped grain silos adjacent to the new tower.